« IRS To Revoke Passports of 30,000 U.S. Troops? 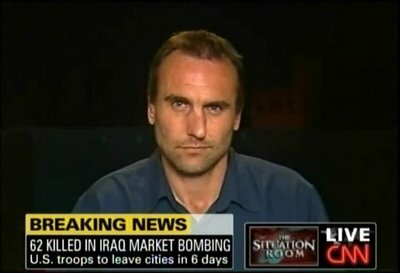 (Red Ice Creations) War correspondent Michael Ware worked for CNN from 2006 until April of this year, during which time he became known for covering the hellscape of our wars in Iraq and Afghanistan with brutal honesty and a keen analytical sense that often cut against the standard talking points. He’s since been struggling with post-traumatic stress disorder and today the Brisbane Times is reporting on an event that might have contributed to that — an alleged 2007 war crime that CNN refused to air. Ware goes on to describe his mental state during that time, in which he realized that he was “more concerned with the composition” of his photo than he was with intervening in some way. “I indeed had been indifferent as the soldiers around me whose indifference I was attempting to capture,” Ware says. In 2008, Ware gave an interview with Men’s Journal’s Greg Veis, that hinted at his mental anguish. It’s October, six months after our first meeting, and Michael Ware, 39, is at his girlfriend’s apartment in New York, trying to tell me why after six years he absolutely must start spending less time in Iraq. He’s crying on the other end of the telephone. Whether or not that incident contributed to CNN’s decision to not air the footage Ware is now describing, it is at the very least, context worth remembering. CNN is said to own Ware’s footage of the incident he describes today in the Brisbane Times. We have reached out to CNN for comment and will update as soon as they reply. You ended your excellent podcast expose on Leon Panetta by remarking that this was anarchy. Actually, it’s the opposite, it’s tyranny: arbitrary or unrestrained exercise of power; despotic abuse of authority. The traditional definition of anarchy is: a society without a publicly enforced government or violently enforced political authority. Anarchy as chaos is a new way people use the term in the U.S.